While you are studying abroad, one of the last things you are thinking about is returning to Manchester to finish your degree. Whether it is a single semester, your final year or returning to do a masters, returning to academic life in Manchester offers a unique set of challenges which is not often associated with the process of studying abroad. Having spent an academic year at Arizona State University (ASU), one of the main differences I found was the weather. This may not sound like a big deal, but having gone almost an entire year not having to wear anything more than shorts, it can be surprising how much of a difference walking to a few lectures in the rain can do. This can significantly affect your mood and potentially your academic progress. I found the best way to overcome this was remind myself why I had chosen the University of Manchester in the first place, which involved getting stuck back into my course and playing football again after a summer off. After the first week or so once I had adapted to Manchester to being the norm again and stopped drawing constant comparisons with my year abroad, I soon found that this initial shock could be easily overcome. While studying abroad there can often be a big difference between the academic side whilst abroad compared with back in Manchester. This means that getting back to Manchester and doing assignments again can be daunting. This is especially the case for returnees like me whose year abroad did not count towards their final grade but instead was pass/fail. In addition to this, courses in Manchester may also include information from the previous year, which you may not be aware of if the classes during your study abroad did not cover the same topics. Getting by this may include spending a little extra time on assignments and study than you would normally need to initially, however this is far outweighed by the benefits of studying abroad and all the amazing experiences you have had. This is also not that of a big deal in the long run, in my own experiences I only had to deal with acclimatizing to doing assignments in Manchester for the first couple. The biggest challenge I found, which is probably different for different people, was going from studying abroad where I was travelling and constantly experiencing new things to being back in Manchester, where the initial shock of moving back is replaced by a sense of familiarity and the every day. Going from one to the other is often coupled with not enjoying Manchester as much as you used to and the feeling that your study abroad never actually happened. While I was walking to the Ali G it was hard to believe that just a few months earlier I was travelling around America on the back of studying there for a year. Despite this however it was good to see people again that I hadn’t seen since the last summer and overall getting back to Manchester after a summer of seeing friends and family isn’t so bad. While studying abroad is a great experience and one I wish I could re-live over and over again, returning to Manchester is often not discussed or viewed as part of the process. Overall I found that because of this when I returned back it took me a while to get back into my stride. Once I had done this however, I could get on with finishing my degree while being able to look back at all the fantastic memories I had of the time I was away. It’s obvious that when you move to the other side of the world, there are going to be some big changes. Jetlag, time differences, climatic, academic and cultural disparities had all been weighing heavily on my mind in the last few weeks approaching my 25-hour flight from Manchester to Brisbane. But strangely, what took me by surprise the most upon landing was the amount of time it took for me to adjust to the fact I was in Australia and no longer in England. Those that read my last blog will know how much I wasn’t really looking forward to going back to the U.K. The sting of going back home was dimmed a little, as i undertook a 2 and half week venture into Canada, starting in Vancouver and ending in Toronto. During this time I met up with some friends i met on my exchange abroad and family members that i haven’t seen in years. I was taken paddle boarding round Vancouver city, to Whistler for Canada day and to the Calgary stampede (one of the biggest Rodeos in the world). Its fair to say i had a great time. Now I’m back, I really want to be in Australia again. I’m actually getting jealous of friends that have graduated and are making there way over to Australia to begin there journey, even though I had the chance to live there for a year. I was however greeted with some fantastic weather, with temperature reaching upwards of 30 degrees. This made me feel slightly better when I received a video of an Australian friend, showing the hail and rain that was ensuing in Perth. Some of the first people I met up with were actually, a group of Australians, I lived with that were travelling round Europe for the summer, which was nice for me and they were enjoying the sun. Seeing family and friends was nice, although I find myself bored already, it actually didn’t take long for my mother to recognise this. Im trying to keep myself busy seeing friends, training and sorting out dissertation work, but i think i really need to get back to Manchester to get into the swing of things again. I need to have that routine back in order to keep myself occupied and not think too much about the year I’ve just had and left behind. This was only a short blog just to give an insight of how things are back home. I will update you all further when i actually get back at Manchester and back into my 4th and final year! It has been a couple of months now since I set foot on campus. I’ve been amazed by the difference in how UoM (University of Manchester) and UMass Amherst (University of Massachusetts at Amherst) are run. I have to say that one blogpost may not be able to portray my understanding and feeling but I will have a go. First and foremost, I will avoid mentioning UMass Amherst Dining as I believe no blogger or blog post can do it justice. No wonder it has been rated in the top two for several years running. If you are in Manchester and wondering why the big deal about food, it may be helpful to know that most American Universities have their students living on campus so making food available within campus is their duty, unlike UoM where most students live off campus. I will start by stating the differences in academics. You are starting a marathon and you hear ‘On your marks, get set, go!’ That’s how it feels from the first day through to the end. Homework and graded quizzes every week, midterms for every subject, essays and finals. There are no gaps between final exams. You finish your course today then you could either have your exams the next day or the week after the weekend. Unlike at UoM where you’ve got at least four weeks between end of class and start of exams (Christmas break and January exam & Easter break and May/June exams). At UMass Amherst, a nutritionist student can take a Political Science class regardless of major or minor, a Physics student can take an English class. At UoM, an Economic students taking a Biology class will receive an email from her programme administrator with a short content ‘Please see me!’. The reason UMass students can and UoM students can’t could be because the latter spend three years at University while the former four years, therefore having an extra year to diversify your learning. I will leave it to you to suggest whether this is beneficial or not. The Learning Resource Centre is run by students including the receptionist. Students are paid above the minimum wage to assist other students. This is additional to Teaching Assistants’ and Professors’ office hours. They are located on the 10th floor of the world’s tallest academic library – Du Bois Library. Unlike UoM, UMass Amherst is the heart and soul of the city. One resident of Amherst said to me that when the semester ends, Amherst becomes a ghost town. I must admit that UMass Amherst does a lot to make their students feel at home since it is situated in arguably a remote area far away from a main city or shopping complex. Speaking of shopping complexes, the University does take advantage of students as they overprice their products at the University’s Store. The store is probably 15 times larger than UoM’s and sells products from nails cutters to MacBooks. Events are regularly held in order to help keep the students at ease since there isn’t a lot going on other than the regular flat and fraternity parties on Friday nights nd weekend. This semester there were performances from Tinashe, Fetty Wap, Jason Derulo among others. Student employment is quite impressive. Through an email, the UMass’ Human resource department wrote to me that 9884 students (Graduates and undergraduates) work for the university in capacities such as dining hall attendants, security personnel at halls and receptionists at the University’s hotel. UMASS student firefighters help the local fire department. Another interesting fact is that UMASS students drive the local buses that take students around university and town. My roommate drives one of these buses and says that other than being a good paying job it is enjoyable too. Sport participation is something like I’ve never seen before. As a result of sport participation, students frequently end up not undertaking some of their assessments. However, their assessments are rescheduled since sport participation qualifies to be a valid mitigating circumstance. Lacrosse is by far the most popular sport. The free gym which is made available by the University helps keep the athletes and other students fit. It was quite a busy semester but it has now come to an end. Needless to say that I’ve definitely experienced a different perspective of life. As promised, my last blog was on the fun, positive side of Berlin and studying abroad (or a taste of it anyway). This blog is something a bit different – mainly because my study abroad experience certainly hasn’t been all rainbows and sunshine all the way through. These occasional periods of negativity, which eventually lead to greater insight into myself and therefore a positive outcome, are anti-perks. So. It’s definitely been a while. Like, a really, really decent while. Everything’s been quiet on the blog front while everything’s been hectic and busy on the ‘year abroad life’ front. I’ll start not by making excuses, but making a plan: this blog will be a general (hopefully interesting) ramble on things that have gone on for me recently on this period of time abroad – because it really is amazing in its own unique way. Then, there’ll be two blogs on all the fun things/hard things that have happened, all the stuff I’ve enjoyed (or not) and why/what I gained from these experiences, which I think is a pretty interesting topic, no? I have been at CUHK for almost three weeks now and while everyone at Manchester has just finished exam season, here at CUHK we only have one more week of classes until the Chinese New Year break – meaning I have a lot to talk about! 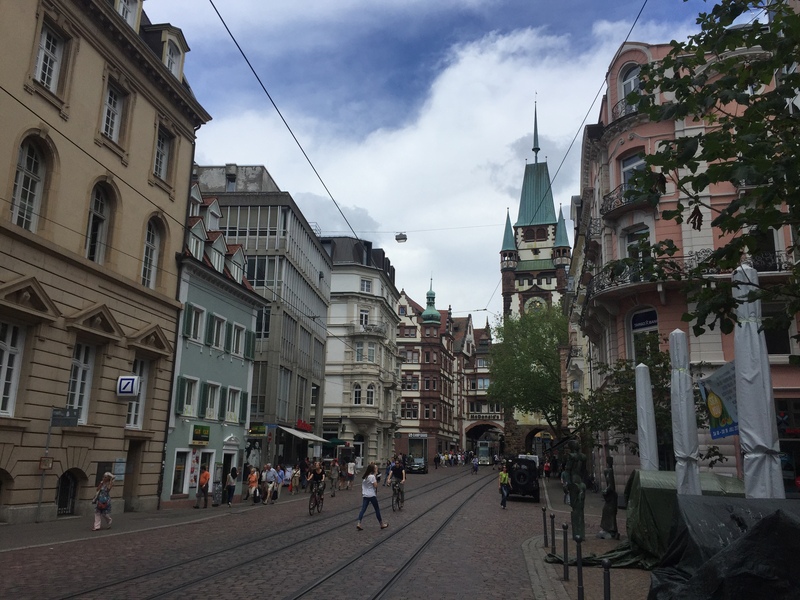 After another two weeks of travelling in Canada and the US, I eventually made my way back home – first to Germany and then to Manchester (at last). 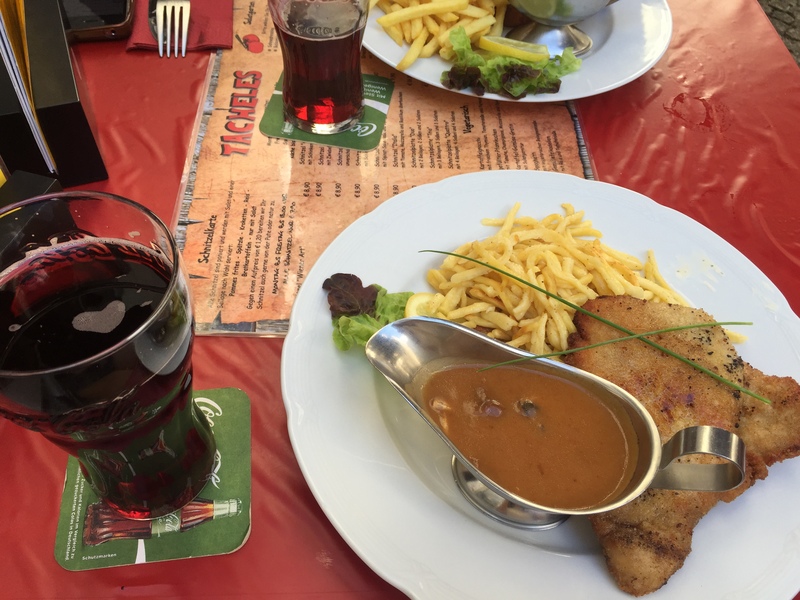 …or a good wiener schnitzel with spätzle – a typical German dish. Back in Manchester I worked as a student ambassador for a couple of days before starting my internship. 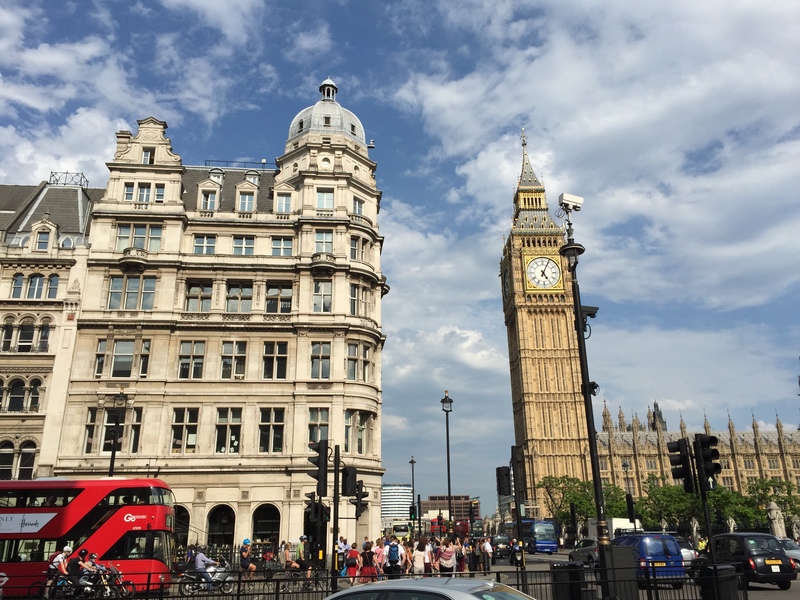 As part of the internship I sometimes travel to London and I must admit I was quite surprised when I found a sunny and hot London (it was over 30°C!) instead of the cold and rainy one I was used to. I mean, where is the rain?! Where is the wind?! Why is it not cold?! Well, at least the red buses are still there and of course, the impressive architecture. London never fails to amaze me in some way or the other – and neither does Manchester. Although it is in the middle of summer and many of my university friends are back in their home country or travelling, I was very pleased to see some of them during graduation in July. It is unbelievable how fast time has passed. Two years ago I first arrived in Manchester, not knowing a single person. This year I am welcoming new students to our University in September, with a wealth of experiences to share. And next year? Next year I will (hopefully) be where some of my friends were this July – graduating with a degree from The University of Manchester. Let’s see what the future holds in store for me, but whatever is going to happen – the beautiful memories I have made in Canada will always stay with me. It is hard to reflect on my study abroad year without spending the next few hours wishing I was still there. The whole experience was amazing! I have used the positive experience I gained from studying abroad to encourage others to do the same, by volunteering at study abroad fairs and meetings through the Global Ambassadors programme. Studying abroad also encouraged me to socialise with students from other cultures, therefore, once I returned to Manchester I participated in the Global Friends programme throughout semester one and worked at the international students’ Orientation in September which enabled me to interact with students from all over the world. Studying abroad gave me a real passion to gain more international experience. I am looking at graduate opportunities abroad which will hopefully take me to another part of the world which is something I wouldn’t have thought about without studying abroad. 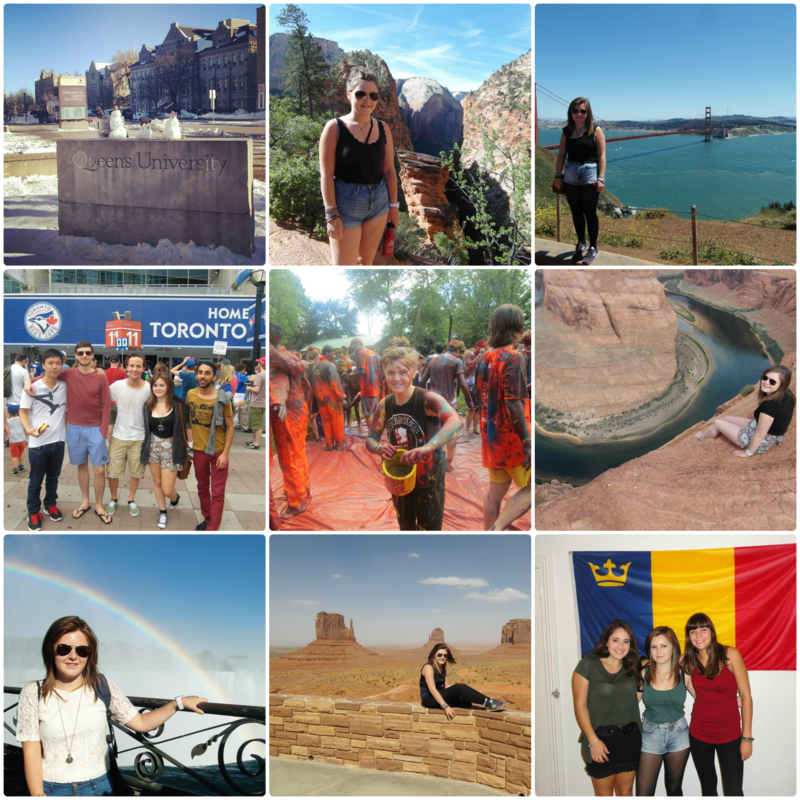 The photo collage below shows all my favourite snaps from studying abroad!